While Manila may fare better as compared to some of its neighbouring Asian countries, it is still considered to be under an unemployment crisis. However, in mid-2015, the Department of Labor and Employment released statistics that show the significant increase of employment rate in Metro Manila which is at 90.7%. The range of salary in Manila depends a lot on your field of work and skill-sets. It is also being regulated by the Department of Labour and Employment. The minimum wage for white-collar Filipino workers or those who are in corporate offices is €400 to €600 per month while those who are categorised as unskilled workers receive a minimum salary of €200 to €300 monthly. Employers will generally base your premiums and wage based on your previous salary from your home country. Major employment sectors for foreign nationals in Manila are NGOs or Non-Government Organisations, privately owned business and the education sector. Expats who are planning to work in Manila should expect a stiff competition because, under the Philippine labour law, any company who wishes to hire a foreign national should present first a valid document which states that the local labour force is insufficient to fill the posts. Once a job vacancy opens, you still need to secure an Alien Employment Permit or AEP from the Department of Labor and Employment to prove that you are permitted to work in Manila. Once you landed a job in Manila, it is imperative that you equip yourself with adequate knowledge about the local labour law to protect your rights as a foreign worker abroad. In Manila, an employee works an average of eight hours a day or 40 hours a week. All workers are also entitled to have two rest days which are normally from Saturdays to Sundays. Any excess work beyond eight hours or overtime shall be paid an additional of 30% that based on the employee’s hourly rate. Employees are also entitled to a minimum of five paid leave days given that she/he has already rendered a year in the company. Manila and the whole nation have a total of eighteen national holidays each calendar year where four are classified as ‘special non-working holidays’. Any employee who works on a holiday is entitled to receive twice the amount of their regular salary for the first eight hours. Resident citizens with income either from a foreign or local company, non-resident citizens, aliens (citizens or not) who are receiving income sources in Manila or within the Philippines are required by law to file their income tax returns. The Bureau of Internal Revenue is the designated government agency who is in charge in assessing and collecting national internal revenue taxes. Income tax in the country is levied at 5% up to 32%. 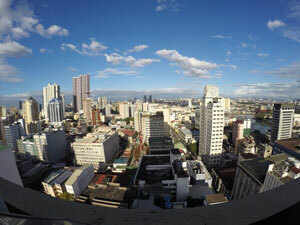 Manila is a city that glides gracefully with technology. Almost anything and everything can be done online including job hunting. You can search for employment from the comfort of your home by browsing through job portals such as JobStreet, JobOpennings Philippines and Career Jet. Expats can also look in the classifieds section of newspapers for job openings in Manila. Expats who will relocate in Manila will see that their local colleagues approach hard tasks and stress in a light manner. Compared to most westernised countries who address their superiors by their first or last name, Filipinos are used to calling their bosses Ma’am or Sir. It is a way of showing respect to those in higher positions. Filipinos are very hard-working, can easily adapt to any type of work environment, and are known for their hospitality. Team buildings out of town and family oriented company events are also common in Manila. Some employers have a separate budget to fund outdoor or recreational activities that’ll help build camaraderie among their employees.